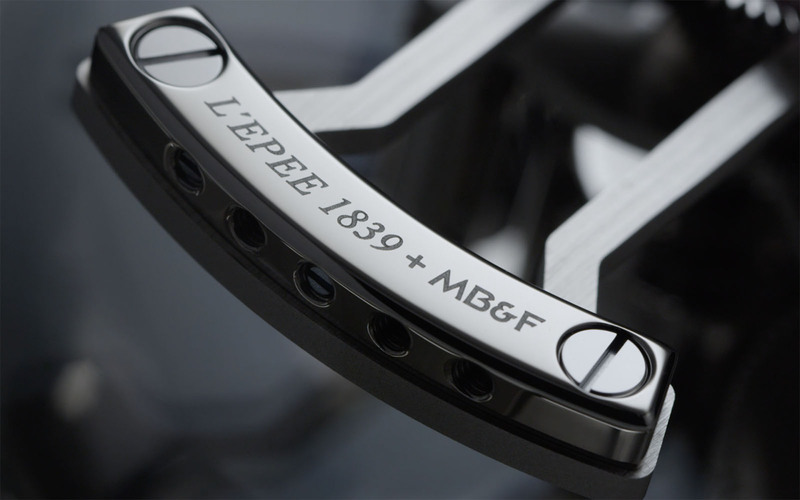 MB&F presents its latest "kinetic sculpture". Having brought us the HM7 Aquapod, a watch initially inspired by a jellyfish sting his wife suffered, Maximilian Büsser continues his exploration seawards with a sea creature-inspired clock. 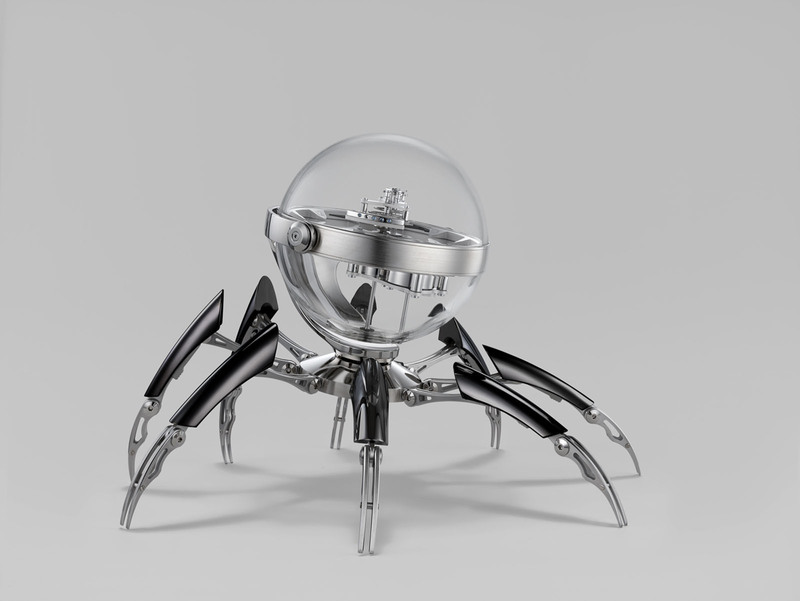 The Octopod was designed by MB&F – short for “Maximilian Büsser & Friends” – but engineered and built by its long-time partner and master clockmaker, L’Epée 1839. 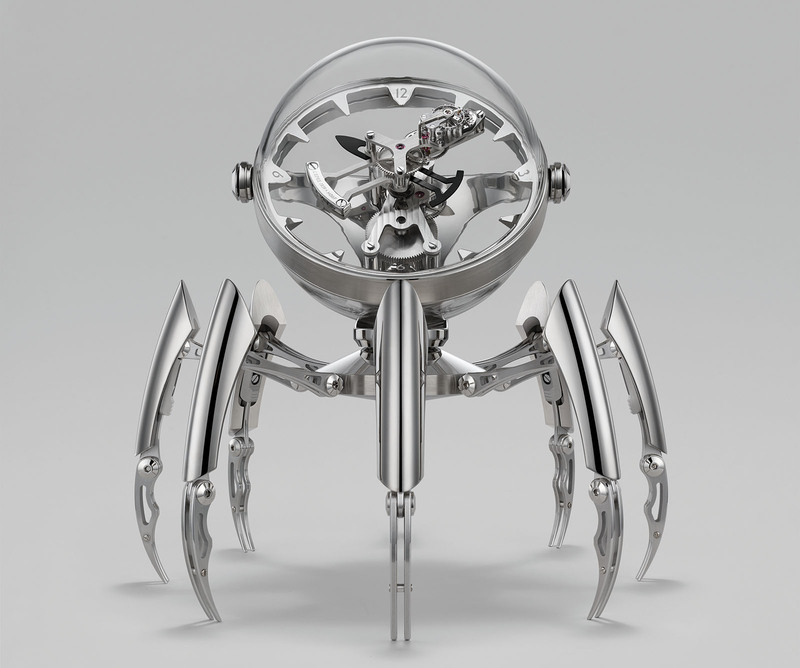 For over 175 years, the company has been manufacturing traditional high-end clocks comprised of handcrafted components, and more recently, all of MB&F’s sci-fi clocks. The inspiration for the Octopod runs the gamut of marine nomenclature, from cephalopods to marine chronometers to James Cameron’s underwater thriller, The Abyss. 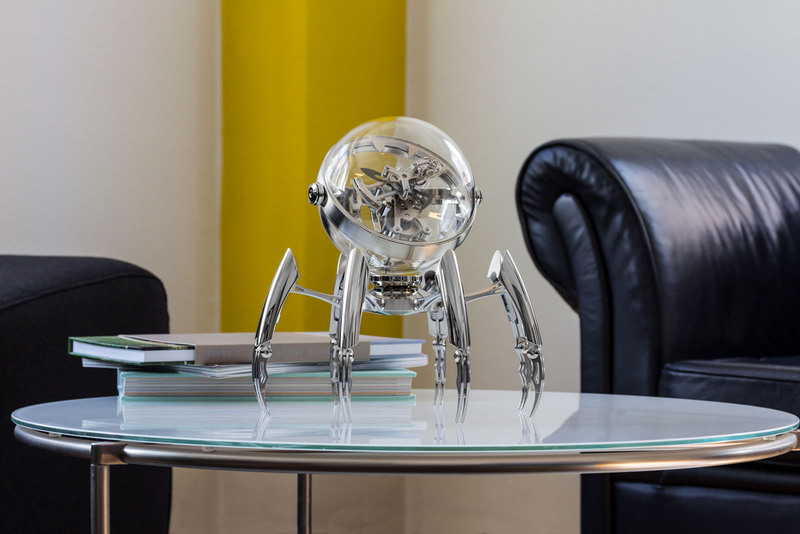 Made of palladium-plated brass and stainless steel, the Octopod stands on eight articulated legs, much like the Arachnophobia, which can be individually adjusted to varying heights. The head of the Octopod is made up of a transparent spherical case partially suspended from gimbals, not unlike how marine chronometers were gimballed so as they remained horizontal on a heaving ship. Taking muse from the glass bathysphere in The Abyss – a 1980s sci-fi flick where humans encounter benign aliens underwater – the bubble-like case is made of two hemispheres of polycarbonate. The idea was to create the illusion of a floating movement, and to that end, it had to be mounted on a baseplate made of glass. The transparent glass baseplate was treated with a film of anti-reflective coating on both sides so that it becomes virtually invisible. But the greater challenge lay in finding a glass supplier capable of precision machining with extremely tight tolerances. The escapement rotates once per hour, doubling up as the minute hand of the clock, which has the balance wheel mounted at its tip – functioning in a manner similar to the Ulysse Nardin Freak. Because the entire spherical case is rotatable both horizontally and vertically, it is, in essence, a tourbillion (or a carousel) on a gimballed mount. 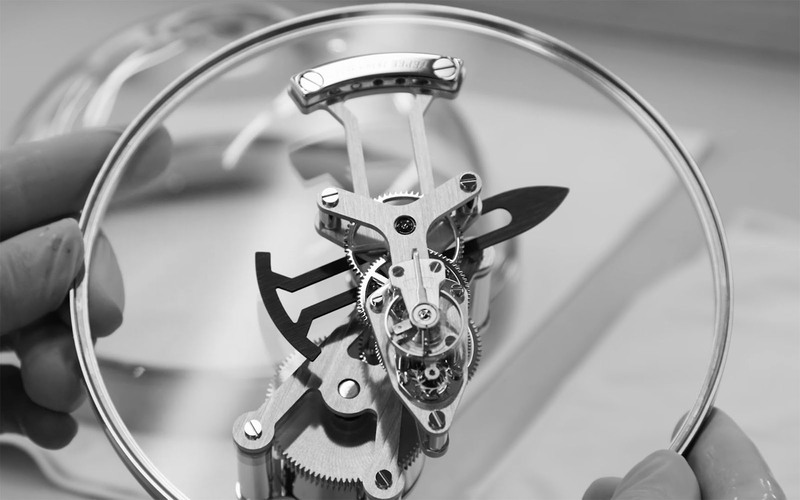 This movement construction gave rise to the challenge of having to adjust the escapement’s counterweight, crucial in ensuring that the balance wheel oscillates undisturbed while the entire escapement rotates. 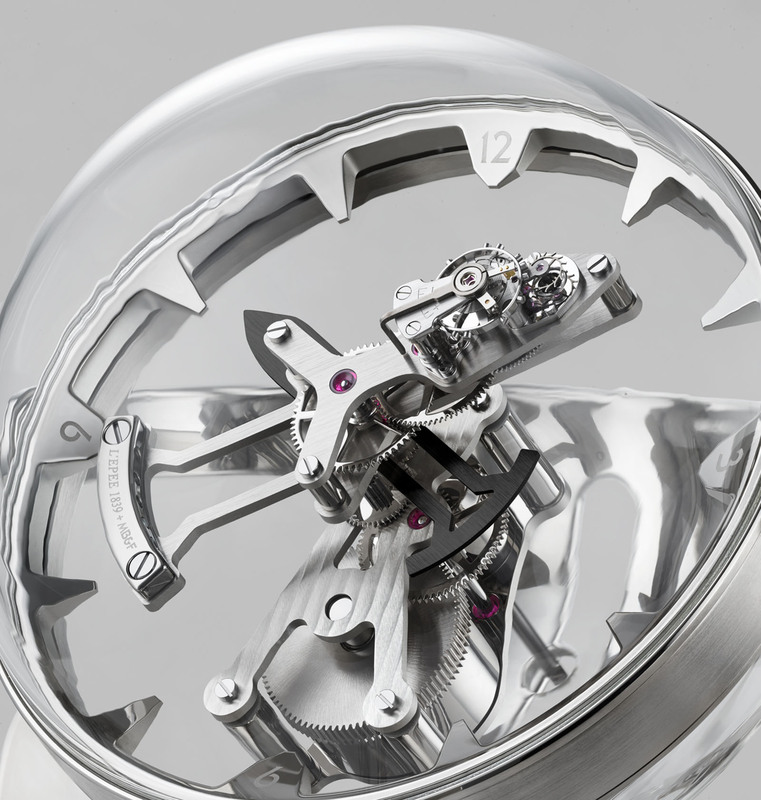 A total of two screws and five minuscule adjusters had to be installed as counterweights on the free end of the minute hand to ensure optimal timekeeping accuracy. The energy demands of overcoming the inertia of the entire movement result in a single, huge barrel, which will run for eight days when fully wound. 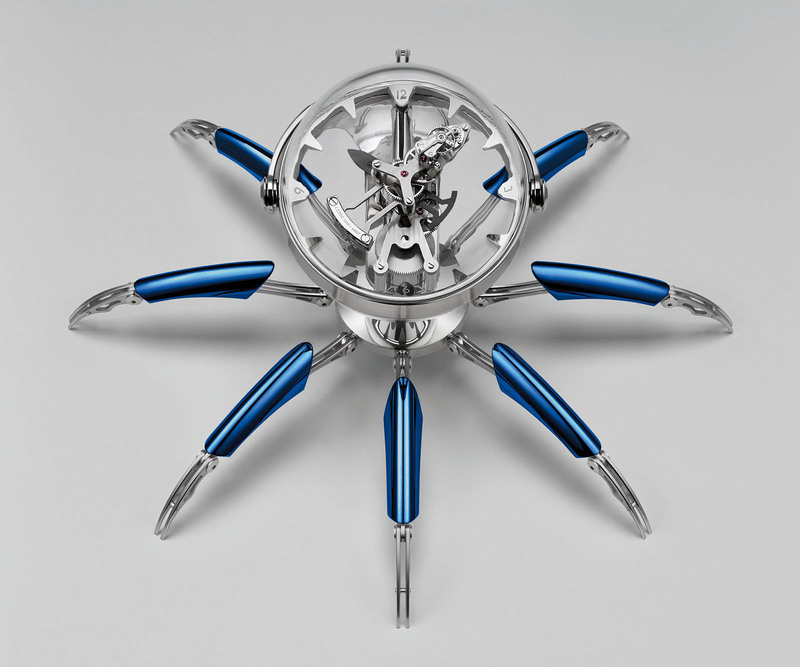 Measuring 28cm at its full height, the Octopod is available in three different finishes of black PVD, blue PVD, and palladium, each limited to 50 pieces. It is priced at SFr35,000 including tax, or about US$36,300.